We believe it is very important that the puppies get that close contact with us from the beginning and get used to all kind of noises in a household. Our puppies are born in our kitchen and spent much time with us, visitors, other dogs etc. They have a lot of housetraining at 8 weeks old. We are very concerned about health and temperament combined with an excellent exterior, that makes i possible to win in the showring... Aggresive or shy mastiffs are not tolerated, we breed by "the natural way" and our breeding mastiffs are healthy. We do x-rays of hips and elbows and do not use unhealthy mastiffs for breeding. The foundation of Kennel Hugedogge is mastiffs importet from The USA out of very strong bloodlines combined with some of the best danish/dutch bloodlines. 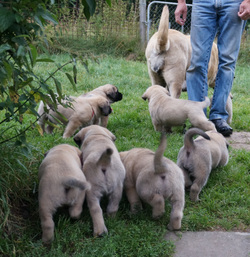 We breed by the principle making better mastiffs instead of more....., and we only have one or two litters a year. We feel responsible for our breeding and stay in contact with "all our puppies", - also those gone to foreing countries. This is the way we want it!! We work hard finding the right homes for our puppies. Visit us and meeting personally is the best case, but we do send puppies out of the country, if we feel confident about the new home. We have sold puppies to France, Holland, Belgium, Italy, England, Norway, Sweden, Germany, Portugal, Switzerland, Austria, Finland. We want to stay in contact with the new owners, who can benefit from our 16 years expirience with breeding, - and almost 20 years experience with mastiffs. We can provide the experience to our puppybuyers and we see how the puppies develope. You are welcome to contact us (visit us) and get more information about puppies, upcoming litters, breeding plans etc.